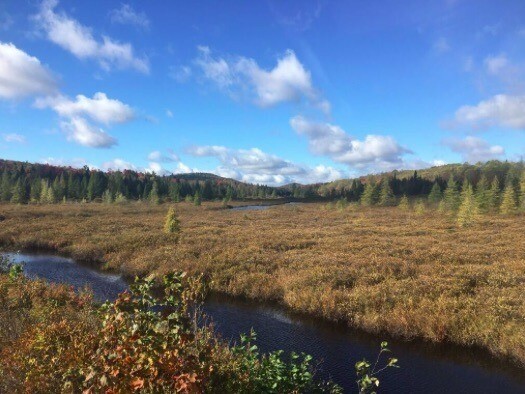 When Alice made this long trek, she inadvertently confirmed the Algonquin to Adirondack (or Adirondack to Algonquin – either way, A2A) habitat linkage (wildlife corridor, or wildway, as some of us prefer to say) that biologists had identified. She inspired a conservation effort that has grown into the A2A Collaborative, of which The Rewilding Institute is a participant. 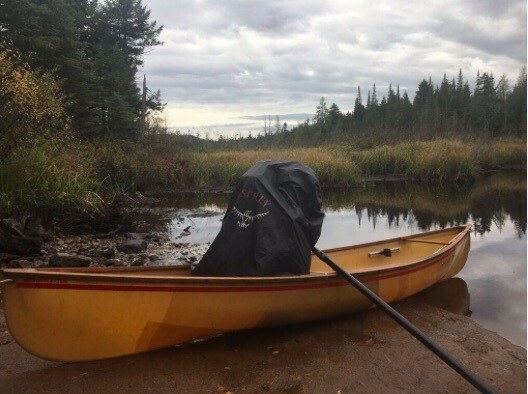 A2A partners on both sides of the border spent much of a month exploring A2A on the ground in autumn 2017, simultaneously hiking northwest and southeast from our respective parks toward the Thousand Islands in the Saint Lawrence River, to celebrate Alice the Moose and the wildway she revealed and to investigate the possibility of an eventual A2A International Scenic Trail. I was lucky enough to do much of the hiking and paddling on the US side; and my scouting strongly confirmed the wildness of this region and its great appeal for outdoorspeople, as well as wildlife. A2A has long been recognized as a regional habitat connection priority, though it has not yet been fully enough appreciated as a habitat link of continental importance. Yet a careful look at geologic and geographic and human footprint maps of eastern North America shows this to be among the most promising links between wildlands in the United States and wildlands in Canada. Indeed, eastern North American lands can be roughly divided between areas south of the Great Lakes and their outlet, the St Lawrence River, and areas north. There are not many easy crossings for terrestrial animals of this vast waterway system (one of Earth’s great drainages). 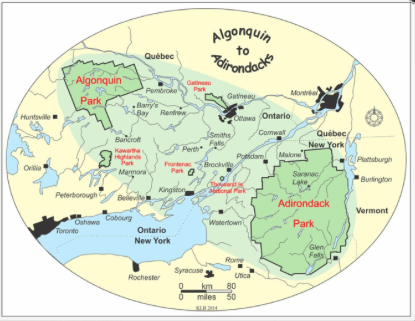 The A2A area, which geologists know as the Frontenac Axis or Arch, essentially an arm of the Canadian Shield reaching southeast to and through Adirondack Park, offers a relatively safe crossing of the St Lawrence through the Thousand Islands, as well as sparsely peopled, still mostly forested habitat connecting the two great parks. Probably many other wide-ranging animals before and after Alice have used the A2A wildlife connection; and it becomes even more important in a warming climate. Likely the famous young male Puma, posthumously dubbed Walker, who journeyed from South Dakota’s Black Hills to Adirondack Park before being killed – still looking for a mate – by a car in Connecticut in 2011 (see Will Stolzenburg’s powerful book Heart of a Lion) came south from Ontario via A2A. If Wolves are to recolonize the northeastern US, likely they will disperse southeast from Algonquin Park via the A2A connection — though many guns and traps around the Park and roads near the border stand in their way. In any case, for my little part of the A2A exploration, I began on a picture-perfect fall-foliage day, October 1, on the Adirondack Interpretive Center trails outside Newcomb, with my friends Richard Grover (A2A co-founder and visionary), Tom Butler (author of Wildlands Philanthropy and other conservation books), and Bart Howe (intrepid explorer and mountaineer). Aptly, we camped the first night on Moose Pond, nestled beneath the western High Peaks. My friends had to return to their jobs next day, and I figured I could hike the rest of the circuit way around Moose Pond and to the Cold River and then along Long Lake, in a day (due in Long Lake to talk with an Adirondack Explorer writer late Oct 3), so I left the trail and followed streams up to a starkly open clear slide cutting down the west side of Santanoni. This I scaled hurriedly, not at all as a Moose would, to get fabulous views of the lake-studded country westward, which Alice had traversed and I’d soon hike and paddle across. Above the slide, spruce/fir forest got thick; and I was not appreciating the Moose browse I thrashed through, before finally gaining the Santanoni summit (4600+’). 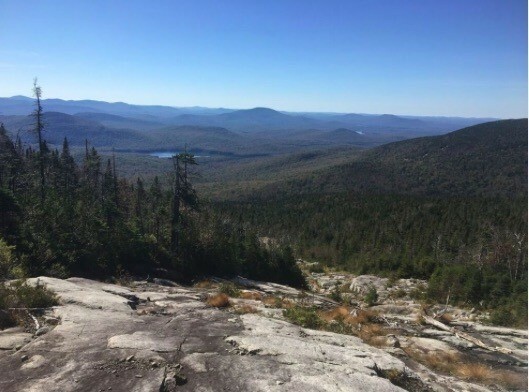 Then I followed “herd paths” (Adk peak-baggers’ term for the muddy unmarked trails up some of the more remote High Peaks) to summits of Panther (highest of multiple Adirondack mountains named “Panther” – would that we still had as many of the great cats themselves!) and Couchsachraga. North of Moose Pond, the hiking and equestrian trail becomes less well-maintained, but is still lovely. Fittingly, I saw Moose tracks following the trail in several places. It took me to Cold River near the farthest place from a road you can get in Adirondack Park, and one of the farthest places from a road you can get in the eastern United States – only about five miles, not nearly so remote as a wildlands explorer, four- or two-legged, would prefer. Then I was on Adirondack Park’s famous Northville-Placid Trail – part of which would be good to include in a larger A2A trail – as far as the village of Long Lake. 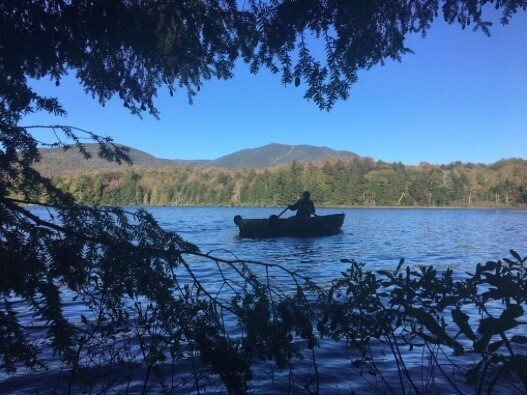 After interviews in Long Lake, there followed three days of classic Adirondack waterway travel, paddling across lakes and along meandering streams, and walking the portage trails (all easily passable, but some muddy) between them. This is also great Moose country, and I saw their tracks often, as well as sign of bear, otter, and other wide-ranging mammals, plus eagles, hawks, Osprey, kingfishers, ducks, and geese in flight. One bold Bald Eagle chased a full-grown Canada Goose past the end of Little Tupper Lake and out of sight. Perhaps the Moosiest and mossiest of these sections are the slow winding sedge- and alder-lined stream between Little Tupper Lake and Rock Pond, Shingle Shanty and Harrington Brooks draining into Lake Lila, and the Oswegatchie River, draining the heart of the proposed Bob Marshall wildlands complex. Indeed, as I made this watery traverse, I recalled that much of the job of securing A2A within Adirondack Park itself is completing protection of the Bob Marshall (or Oswegatchie) wildlands complex, in the northwest quadrant of the Park, as outlined in the past by Adirondack Council and other Adirondack conservation groups. I traversed this many years ago southwest to northeast; but my traverse this time, southeast to northwest, seemed even more beautiful a journey. A boggy stream — good Moose habitat —meanders between ponds west of Little Tupper Lake, central Adirondacks. I’ll close for now (then resume A2A wildway explorations later) with my closest Moose encounter, perhaps my nearest approach to the spirit of Alice. At dusk of my fifth trekking day, I’d sat mesmerized by Big Dear Pond, between Lows Lake and the Oswegatchie River, watching Beavers and a Muskrat foraging peaceably near each other, hearing Coyotes howling in the distance, and admiring ducks alighting gracefully on the still water. 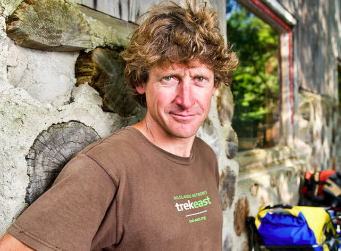 When I could no longer see the animals, I retired to my tent, to study maps and write notes. Just as I was about to turn out my solar lamp and collapse in a hiker’s deep weary sleep, a terrific crashing sounded not a hundred yards from my camp. 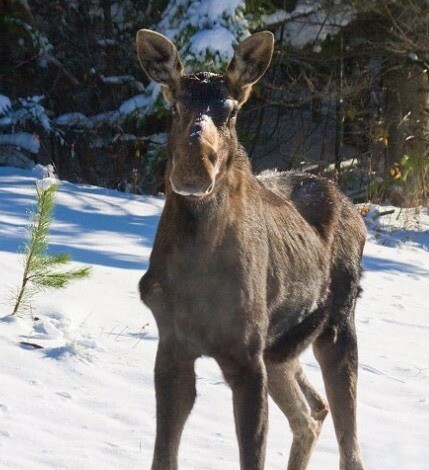 My lamp was not strong enough to catch the creature, but by the noise of him or her moving through the trees, and by the tracks on the portage path next day, I know the big beast was a Moose – moving west, leading me the safest way toward Algonquin Park.